Coming March 26, 2018 Saudi Arabia will have been at war with impoverished Yemen for a punitive 3 years. Yemen’s 26 million people are in a race against time for powers greater and richer than their own seek to impose their will, and their design onto a nation whose only ambition has been to stand free, sovereign and independent. Yemen has become a terrible statistic – one of death, misery, hopelessness and devastation. 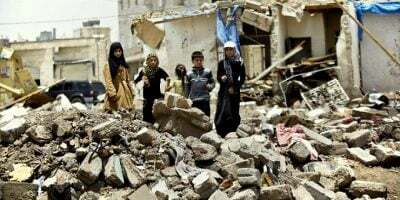 Yemen one would argue exists beyond all manners of contention … when an entire nation sits on the verge of famine, plagued by pestilence, it skies darkened by warplanes, politics quickly becomes irrelevant. And yet, politics we have been told has demanded that more violence still be spent on a people whose lives are but hanging by a thin thread. When the infamous 1 percent discharges lead and chemicals onto the weakest of the weak, one wonders what point exactly that 1 percent is trying to impress on those it labelled as enemies beside absolute devastation. It seems western liberalism has found its match in the towering ambition of Saudi Arabia’s reactionary theocracy. For western capitals to argue in the one breath human rights, democracy-building and nation-wasting by military desolation is a paradox we have all learn to dissociate from. But guilt cannot be rationalised by arguing sociopolitical cognitive dissonance – not if we consider the implications of our disinterest. When hunger becomes a reasonable asymmetrical weapon of war, and political self-determination the privilege of an elite, we might as well consider hanging Democracy and Civil Liberties on the public square and be done with it. What value can we put on Freedom if we are not committed to it on principle? If controversy indeed exists, it has more to do with survival than political preferences, or even ideological inclinations. Political debates have become a luxury Yemenis have lost all taste for … it is death after all which has breached the sanctity of their homes. Death still, that threatens to steal the very future a people once imagined to be its own to formulate. Yemen’s war, if once a complicated affair of overlapping and contradictory ambitions, has been reduced to a very simple reality indeed. Millions stand to die … No! millions will die unless war is brought to an end. The only question left to ask really is: how long before we intervene in favour of peace? If yesterday should have been our first choice, several tomorrows away will do little by way of assuaging our collective guilt. World Health Organization established that of the 1 million people affected by cholera 600,000 are children. When it comes to Yemen numbers and statistics are euphemisms hiding an unpalatable reality. And so it goes: over 2 million children are suffering from severe acute malnutrition and will not live to see their next birthday, 100,000s have been made homeless, over 15,000 have been killed, 10,000s have been injured with no hope of adequate medical care and millions of civilians are awaiting death by starvation, diseases or war. Add to the above a widespread propensity to redact mathematics to better manage public opinion, readers will … I hope, grasp that Yemen’s plight is one of despair beyond despair itself. “The situation in Yemen – today, right now, to the population of the country – looks like the apocalypse,” Mark Lowcock, the head of the UN office for the coordination of humanitarian Affairs (OCHA), told media in early 2018. To put it bluntly we all have been lied to. Yemen’s war is not a military exercise aiming to restore constitutional legitimacy; civilian casualties are not involuntary victims of war – they are the targets. Saudi Arabia we ought to learn is not at war with Yemen but rather its people. Saudi Arabia in all its theocratic might intends to make Yemenis bow to its will just as if they were its subjects. Saudi Arabia is in the business of allegiance and obedience under threat of death, not so much Freedom. Peace we have been told is a complicated affair … Let’s not reinvent the wheel shall we and let’s begin where it mostly hurts – rather literally in fact. Let’s start with the proverbial elephant in the room and call for our glorious and liberal western democracies to call back their hounds and stop all weapon sales to Saudi Arabia. If the kingdom had less lead to dispense maybe Yemen would have enough of a breath left in its beaten and starved body to formulate a peace plan. Peace is really not THAT complicated! But it will certainly cost war profiteers millions of dollars in lost revenues. For weapons to be laid down and guns to be silenced, weapon sales need to be halted. If indeed it would be folly to consider arming criminals in our streets for it would put the innocent in harm’s way, then it stands to reason to refrain from arming those who have no qualms targeting women and children to score military points. Most western nations, might it be Canada, the United Nations, France or even Germany prohibit the sale of arms to countries with a persistent record of serious human rights violations or war crimes. And yet those same governments have sanctioned the sale of weapons of war to the Kingdom of Saudi Arabia – a country which holds an abysmal human rights track record, and proved feral in its military ways. The onus is now on those governments to abide by their respective rule of law and hold those principles they say to represent and carry. If the old adage still holds that:He who kills an innocent, it is as if he has killed the whole of humanity … what should we say of silence?